I’ve pondered this one for a while and I now have two different visions of what Orwell might have meant when he thought of the smell of rubbish fires. The first is a grim, urban image. It’s a year – an anonymous one – in the 1940s and we’re in a narrow alley that runs behind two rows of tenements in Islington. These houses are an assembly of cracked pipes, dripping walls and damp corners. But their inhabitants have been hardened into stoicism, and, neglected by the state, they have taken to disposing of their rubbish in daily bonfires in the square yards behind their houses. The smoke of these fires curls up and over the wall and hangs like a sheet in the stale autumnal air, leaving a sour taste in the mouths of anyone walking by. It’s a detail that may well have been noticed by Orwell, who delighted in recording the gritty and the commonplace. Today you can find evidence of such scenes in the work of street photographers like Bert Hardy or Bror Bernild who stalked the inner boroughs of the capital at this time, capturing shots of the choking smogs that settled during calm spells of weather and shrouded rows of pre-fabricated houses in a thick and milky mist. House fires, cheap fuel and rubbish fires combined to create this atmosphere, an atmosphere that left people with weakened chests, hollow coughs and reddened eyes. It could hardly have been any good for Orwell himself whose chronic tuberculosis was to drive him out of London after the war and would shortly kill him. Only after the Big Smoke of ’52 did the government finally act to improve conditions, passing The Clean Air Act in 1956 – something we all benefit from to this day. Or perhaps Orwell was thinking of Wallington, a time when he was immersed in the rhythms of the agricultural calendar and far away from the alleys of Islington. He thinks of a day when he earthed up roots, raked heaped piles of dead leaves into a corner and lanced off the top thirds of his roses and buddleia. 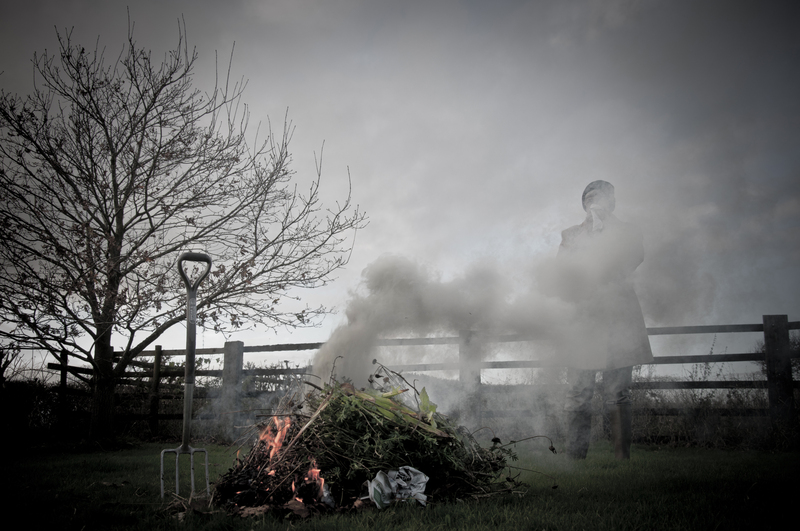 On this day, a day long before recycling and in a far more pragmatic age when all the benefits of composting are outweighed by the pressures of time and the troubles of finding enough space, he pulls a match from his pocket and sets the pile alight. It’s a damp fire but at last it catches, and fills the air with brownish smoke. I didn’t have much chance to recreate the first of these imagined scenes, so back in the Staffordshire countryside I had a go at the second. From the start I wanted it to be a darkish image, so I’ve left it a little underexposed and I’ve added a vignette to bring attention to the bonfire – which was piled up with debris from around the garden. I took it lying flat on my stomach with the young oak tree in the background used to balance the composition with the person on the right, who’s keeping the fumes from her face with a handkerchief.